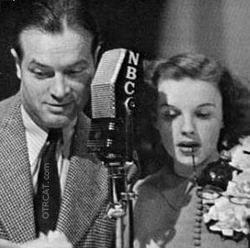 "Judy Garland on Bob Hope Show"
Judy Garland star of screen, stage, and radio is a Hollywood legend. Her career spanned movies, concerts, radio, television, and she was popular with the U.S. troops when she toured the camps of WWII. Known throughout the world as Dorothy from the Wizard of Oz, she performed her entire life from the age of two to her untimely death at the age of 47. 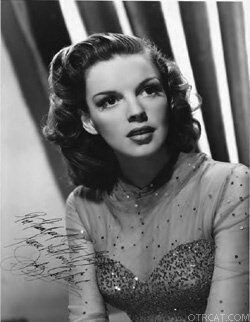 Known to have suffered personal difficulties, Judy Garland continued to perform on stage and remains known as one of the greatest performer of all time. Born as Francis Ethel Gumm on June 10, 1922, her mother managed her and her two sisters ("Suzy" and "Jimmie") as The Gumm Sisters. Judy was known as Baby Gumm. The group later changed its name to The Garland Sisters with the suggestion of George Jessel, a comedian. Judy, no longer a baby and actively looking for a movie career, choose the name Judy because it sounded peppy. 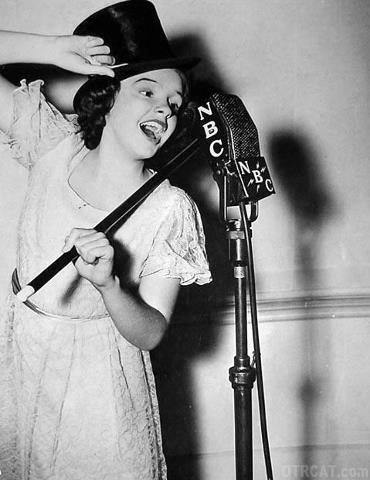 On October 1, 1935, 13 year old Judy with the urgings of her mother signed a contract with MGM. Judy Garland starred in 43 movies, 31 of which were with MGM. Her biggest features were Wizard of Oz, Meet Me in St. Louis, Easter Parade, The Harvey Girls, A Star Is Born, In the Good Old Summertime and The Pirate. She married five times throughout her life (including being married to David Rose). In 1945 she married Vincente Minnelli, who had directed her in 'Meet Me in St Louis.' In 1946 her daughter and a starlet in her own right, Liza Minnelli, was born. This fabulous collection is an anthology of guest appearances of Judy Garland staring and singing in the most popular old time radio shows such as the Bing Crosby, Lux Radio, Screen Guild Theater , and many others. Be the first to comment on "Judy Garland"